As Lac-Mégantic, Que., prepares to honour the 47 victims of the 2013 runaway train and explosion that destroyed the town, many are questioning what safety measures, if any, have improved since the tragedy. Rail safety advocates say that five years after the Lac-Mégantic train derailment, not enough has been done to prevent similar tragedies from happening elsewhere in Canada. On July 6, 2013, 47 people died when a train loaded with 7.7 million litres of fuel rolled unmanned into the downtown core and exploded in the middle of the night. Commemorative events honouring the victims will take place throughout the day on Friday. 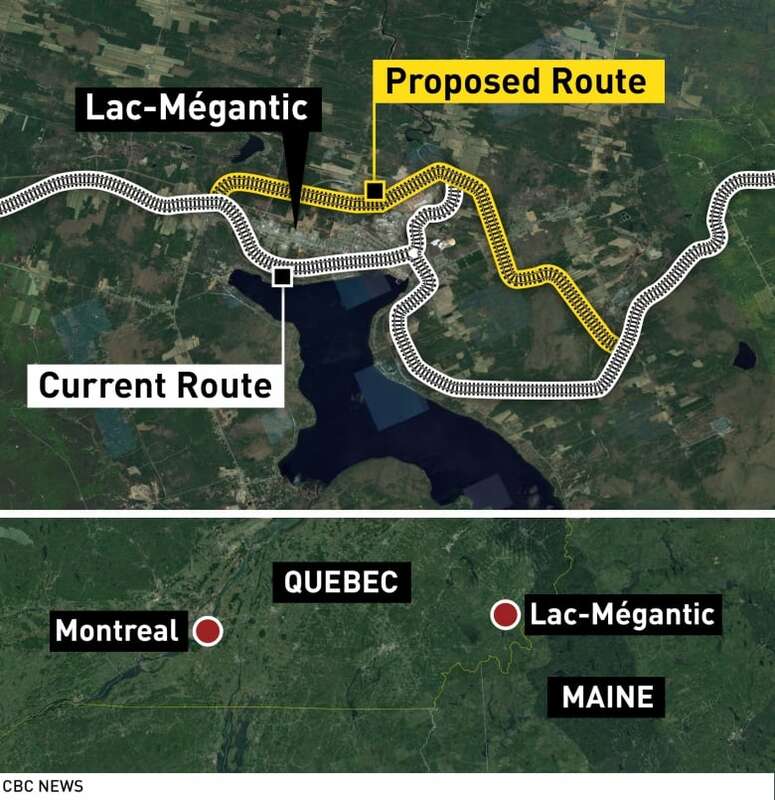 Meanwhile a citizens' committee for rail safety and surveillance will mark the disaster by heading north to the neighbouring town of Nantes, where the train started rolling down the steep hill toward Lac-Mégantic in 2013. "Five years after the tragedy we have not seen a significant improvement of rail safety measures," said Robert Bellefleur, a spokesperson for the Coalition des citoyens et organismes engagés pour la sécurité ferroviaire. Tanker cars carrying dangerous goods are regularly parked at the top of this steep hill above the town, Bellefleur said, a disturbing image for people who drive past. "The main risk factor that contributed to the tragedy is not even solved," said Bellefleur. The federal and provincial governments this year promised a new track to bypass the town, but in the meantime, trains are still following the tracks that were at the centre of the disaster. ​In its 2014 incident report on the tragedy, the Transportation Safety Board (TSB) found an insufficient number of hand brakes had been applied. Transport Canada then toughened its standards, requiring companies to have more substantial "physical defences to prevent runaway equipment." Nonetheless, incidents of runaway trains have increased by 10 per cent since 2013, according to a recent report released by the TSB. "We know that a lot has been done, but whatever has been done hasn't been enough because we've seen the numbers go up," said TSB Chair Kathleen Fox. In 2017, 62 incidents of uncontrolled train movements were reported to the TSB. While many happened inside train courtyards and didn't lead to serious incidents, their frequency remains alarming, said Fox. The TSB is calling on the government to address the issue to fully meet its 2014 recommendations. "The job isn't done. More needs to be done to reduce the risk of this type of accident in the future," said Fox, including more extensive training for crews and more advanced backup systems. For his part, Bellefleur is far from convinced by these new safety measures, including the decision to phase out DOT-111 cars. The TSB had called for the removal of the thinner-hulled tanker cars for more than 20 years, underlining their vulnerability in case of a crash. But Bellefleur said DOT-111s continue to roll through Lac-Mégantic carrying dangerous materials, like hydrogen and ethanol, even though they can no longer carry crude oil. "For us, what [the Minister of Transport Marc] Garneau did is purely cosmetic." No one with Transport Canada was available for an interview. In an email, a spokesperson told CBC the office has taken "several targeted measures to strengthen the safety of the railway system." Meanwhile residents in downtown Lac-Mégantic are holding onto the hope the train will no longer pass through the centre of town. "We hear it five times a night, screaming its right of passage," said Paul Dostie, a retired French teacher who lives near the tracks. For Dostie, who raised his family in Lac-Mégantic, the only thing keeping him from moving away is the promise made by the federal and provincial governments last May to build a bypass around the downtown core. "I'm not going anywhere. Unless the train stays, then I'm leaving," said Dostie. The bypass itself has been controversial, coming as a surprise to the dozens of homeowners who will be expropriated by 2022 to make place for the new rail line, west of the existing tracks. A large portion of the population was however relieved to know the reconstruction would go ahead. "If we fail, it's like we're telling everyone who supported us that there is no hope," said Dostie.